Find as many of the keywords used by customers when purchasing our product. I will cover the whole subject of indexing of keywords in my next blog post, which will cover Amazon Listing creation and optimization, but for now I want to focus on discovering and uncovering the best keywords for your product. Okay I am going to go through this in a step by step manner so it’s easy to follow along. The first thing we do is to try to identify our “Main” keyword. For some products this is very obvious and in some cases you maybe surprised to find another keyword is actually more valuable (as in it gets more search traffic) than the keyword you initially thought of. 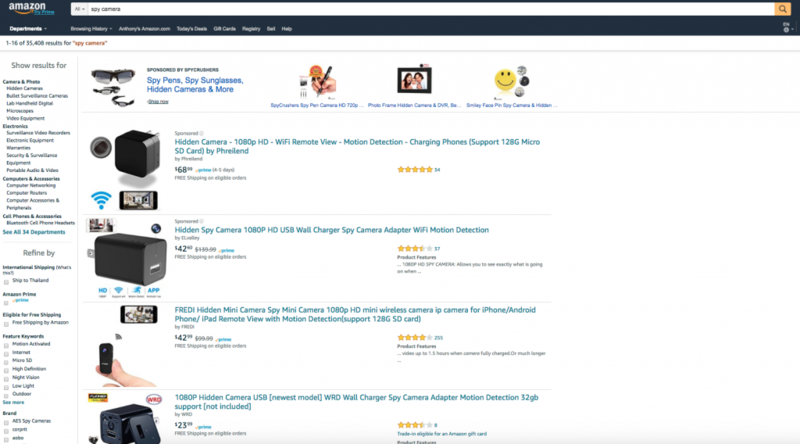 For example: Your product might be a “spy camera” and you think this is probably the main keyword, but if you do a search on Amazon for “spy camera”, we can see that there actually may well be another main keyword. Take a look at the screenshot below. We use the magnet tool together with another tool called Merchant Words https://www.merchantwords.com and with both tools we will enter the two potential main keywords into the tools to see which has the most reported search volume. Usually the tools will point to one clear winner, which is then our verified main keyword. Once we have our “main keyword” we can start to find out all the other associated keywords that relate to our product. To do this we take an in-depth look at the top 15 listings that show up when we search for out main keyword on Amazon. While we carefully go through each listing we start to take note of recurring keywords used and other patterns of commonly used terms. We then start recording all of these keywords in a research spreadsheet. We then take all of the keywords we have found from analyzing the titles and bullets of the top 15 listings and split them up into major and minor keywords, together with some common misspellings. We then start to expand on this by using some more tools and techniques. The first technique is called Amazon suggest. You will have noticed that as a customer begins typing in their search term, amazon starts offering various suggestions, these are based on commonly used search phrases used by customers. 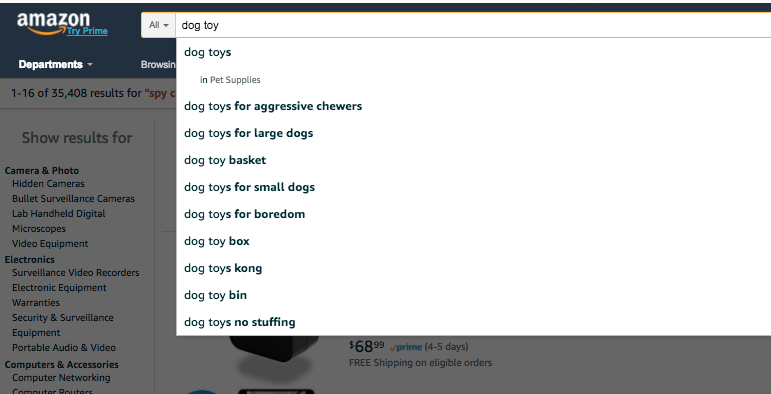 For example you can see below that when I begin to type “dog toy” Amazon start showing us suggestions such as “dog toys”, “dog toys for aggressive chewers”, “dog toys for large dogs” etc. etc. The second tool we use to expand our keyword list is the good old Google keyword planner. Use this to find other keywords related to your main search term. Lastly we run what is called a reverse ASIN search. Using tools such as Helium 10 we are able to find out what keywords our competitors are ranking for. SO we like to run this for the top 5 competitors for the main keyword. When we have finalized our list of major, minor keywords and misspellings (these can be found from using the Misspellinator Tool inside Helium 10). We then create a list of single words from all our keyword phrases. We do this because there is absolutely no value or advantage to be gained by repeating keywords in a listing for the sake of improved ranking. Again there are tools out there for this but we return to Helium 10 and their tool called “Frankenstein Keyword Processor”. Once we have the list of single words, we then remove duplicates. So after this process you should have a list of Major Keywords, Minor Keywords and misspellings and from those you would have created a list of single words. This list will then be used later in listing creation or optimization. I will be covering that subject in the next blog post. AmzAccess offers a professional Keyword Research Package at a very reasonable cost. If you would like to make sure you get off to the very best start with your listing, you need the very best keyword research! Click here for more details.